The Square Kilometre Array (SKA) project’s 2016 science conference, “Science for the SKA Generation”, is currently taking place in Goa, India. Some 200 astronomers from around the globe have travelled to attend the week-long conference, which this year is focusing on bringing early career and senior researchers together to develop new collaborations and preview the science that SKA will do in 2023 and beyond. Throughout the week, we are posting some interesting results presented and discussed at the conference on this page, so please check back daily for updates. You can also follow the meeting on Twitter. Novel image processing techniques have been discussed today at the 2016 SKA Science Conference in Goa, India, as French researchers have updated the international astronomy community on promising work being undertaken in France to develop new algorithms for radio astronomy, with potential applications beyond. French teams from Observatoire de Paris, Observatoire de la Côte d’Azur, AIM Laboratory, ENS Cachan and Université Paris X are actively working on state-of-the-art algorithms for calibration and deconvolution – removal of artefacts in the images – of radio astronomy observations. 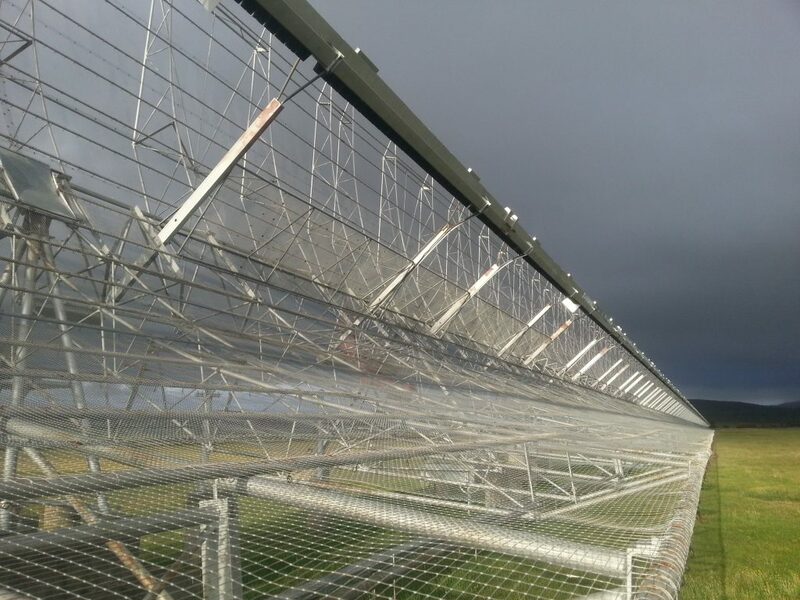 A French team from Observatoire de Paris led by Dr Cyril Tasse is working on developing the equivalent of “adaptive optics” for radio astronomy. Adaptive optics systems – as used in world-class optical astronomy facilities such as ESO’s VLT in Chile – measure how atmospheric turbulence affects known sources in the sky, to then deform active mirror surfaces and compensate for the turbulence, thus resulting in much sharper images. In effect, these systems almost correct the effects of the atmosphere. “In optical astronomy, you apply this correction to the mirror. In radio-astronomy you apply the correction in the supercomputer doing the image processing”, explains Dr Chiara Ferrari, Coordinator of SKA-France (see note). While self-calibration tools already exist in radio astronomy, the French team has developed next-generation “direction-dependent” algorithms that cope with the changing nature of the ionosphere over the observed portion of the sky. These algorithms measure how the signal from known sources in the sky in the area of observation is affected by the turbulence from the ionosphere, and then apply a correction in post processing to cancel those effects. The team recently tested their algorithm on observations of the international LOFAR telescope (from the LOFAR Surveys project, led by Prof Röttgering), producing very promising results. In collaboration with the group of Prof. Oleg Smirnov in South Africa, these next-generation algorithms were also recently used to process the first light image of MeerKAT, one of the SKA precursor telescopes located in South Africa, resulting in a very detailed image where some 1200 previously unknown galaxies were discovered. In parallel, researchers from Observatoire de la Côte d’Azur and AIM Laboratory have been working on developing new image reconstruction tools. 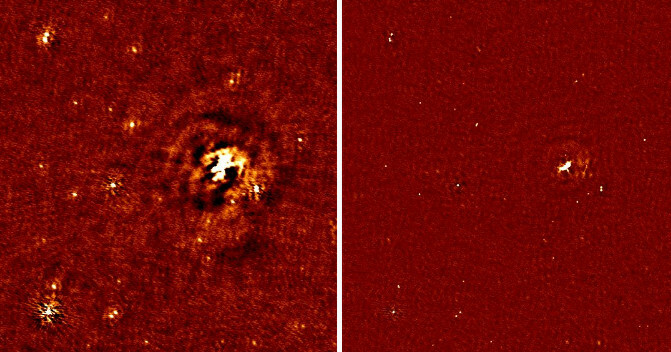 Radio-astronomy observations use so-called Fourier Transforms to create images from observed data. In order to reproduce the image that best models the observed sky, astronomers need to get rid of artefacts in the images caused by the telescope itself, through an operation called “deconvolution”. LOFAR observations at 150 MHz of the Cygnus A radio galaxy. Image obtained before deconvolution (left), and after deconvolution: with classical tools (center) and with the new algorithm developed at AIM laboratory (right). The new algorithm allows to obtain a model image with a better angular resolution (“super-resolution”) than classical algorithms. Classical deconvolution algorithms assume that the sky is populated by sources whose shape can be described mathematically by one set of functions. The work developed by the French teams are based on assuming a wider set of functions. Results obtained so far show that this new tool produces images with better angular resolution (capacity to see more details) and an increased sensitivity (capacity to detect faint objects). Remarkably, the algorithm developed by AIM researchers (Labex UnivEarthS / CosmoStat) was applied to LOFAR observations of the Cygnus A radio galaxy, obtaining a “super-resolution” image. “Since such techniques are currently successfully tested on observations of SKA precursors and pathfinders, we expect them to be of great use once the SKA is operational, allowing researchers to push the limits of image quality with the telescope even further”, adds Dr Ferrari. Beyond astronomy, these techniques also have many other potential applications. “These image processing techniques are of course exciting for astronomy, but can also be applied to any field where image processing is needed, and so are equally promising for medical imaging and Earth observation”, concludes Dr Ferrari. You can also watch this short interview with Dr Ferrari about this research. Results presented today describe a new technique to study the relationship between the early galactic building blocks of the Universe and cosmic magnets. Magnetic fields play a vital role in allowing life to exist on planet Earth. “They allow certain animals to navigate, protect us from harmful cosmic radiation and are vital to the formation of large-scale structures in the Universe such as galaxies and galaxy clusters” explains Jamie Farnes from Radboud University in Nijmegen, Netherlands. But magnetic fields being difficult to detect, these proto-galaxies are not easily observable at radio wavelengths, even with the SKA. Until now, only a few dozen have been detected. To study the relationship between magnets and galaxies, Jamie and his team have developed a double “line-of-sight” technique, which uses a combination of optical and radio data. As the optical light from a bright background object passes through proto-galaxies, a small portion of the light is absorbed and leaves tell-tale fingerprints of the galaxy’s presence in the signal. “It’s similar to trying to study from a distance a lightly tinted pane of glass along the path of a candle, except in this case the pane of glass is 10 billion light years away” adds Jamie. Astronomers then use a similar technique with radio data by measuring the emission from a background object and seeing how a magnetic field in the line of sight affects it. 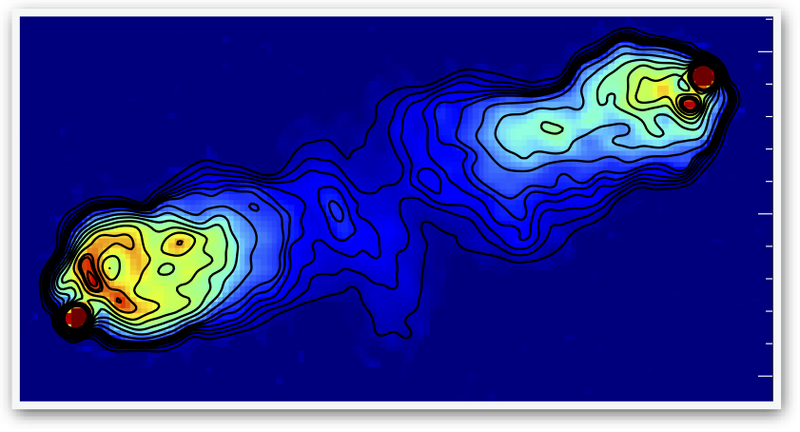 They can then match this magnetic field to the optical observation of the same object. “Confirming the link between proto-galaxies and weak magnetic fields would go a long way in explaining how all the large structures that surround us – the galaxies and the clusters – formed and evolved” he concludes. The research has been submitted to ApJ and is in review. You can also watch this short interview with Jamie about his research. Observations conducted with the SKA could allow scientists to detect the diffuse matter in cosmic filaments – the previously unseen structures that link galaxy clusters together in the Universe – for the first time. A team of astrophysicists led by Dr Surajit Paul from the University of Pune presented calculations predicting the filaments will be observable with the SKA. Scientist’ models predict these structures should be there, however they have not been observed in any wavelengths until now. “The reason is because this material is very diffuse and very cold and so emits very little radiation and is hard to detect with current facilities” said Surajit. “However, thanks to the SKA’s extreme sensitivity and good electronics, we expect to be able to detect them”. With SKA1, the team expects the filaments will first be observed closest to massive galaxy clusters, where they interact with the cluster. The cold gas from the filaments interacts with the hot gas of the cluster, creating turbulence. This leads to particles being accelerated to high energies and amplifies the magnetic field, creating a synchrotron radiation that makes the filaments detectable in radio waves. 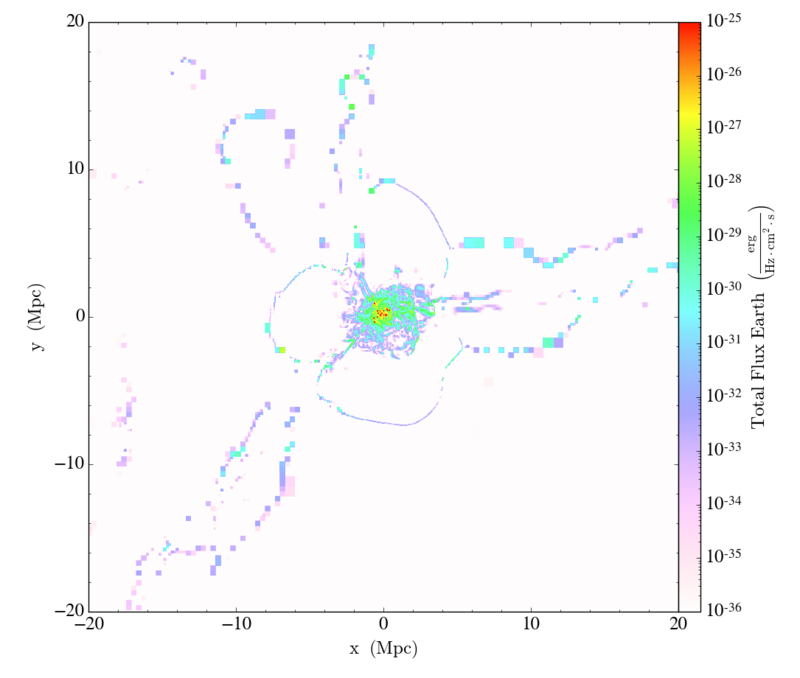 “Eventually, when SKA2 is up and running we hope to detect entire filaments connecting clusters together”. The structure of the Universe is thought to be made of long interconnected filaments of diffuse hydrogen, which are connected by nodes made of large galaxy clusters. These filaments channel the gas into the clusters, thus contributing to their growth. The discovery of the filaments could shed light on one of the most enduring problems in modern astrophysics, that of the missing baryons. In our current models, only 5% of the total energy mass distribution in the Universe is believed to come from normal matter, the rest being dark energy (71%) and dark matter (24%). 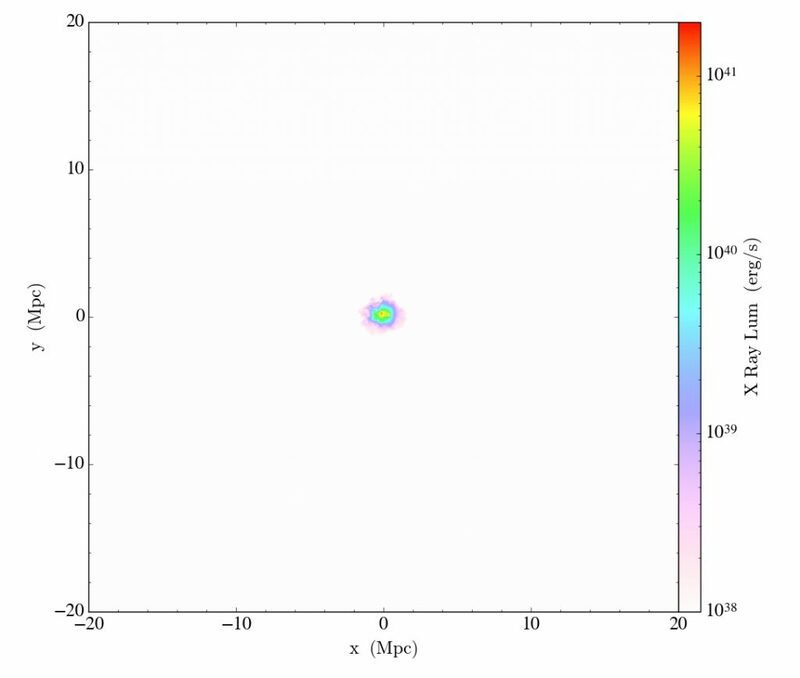 However, when observing the Cosmic Microwave Background – the imprint of the early Universe – we find that between then and now, half of the baryonic matter – matter that emits radiation – has seemingly disappeared and cannot be detected. This research was done in collaboration with Dr. Abhirup Datta and Dr. Siddharth Malu from IIT, Indore. Graduate students Prateek Gupta from the University of Pune and Reju Sam John from Pondichery Engineering College contributed to the work. Simulations for this work were conducted at the High Performance Computation facility of Inter University Centre for Astronomy and Astrophysics (IUCAA) using ENZO 2.1 N-body + hydrodynamic code and post processing done using yt code: (Turk, Matthew et al. 2011, ApJS). The research will be submitted to the Astrophysical Journal in the next few weeks. You can watch this short interview with Surajit about his research. The Molonglo Observatory Synthesis Telescope (MOST) in Australia. Preliminary results presented this morning at the SKA science conference highlighted the first discovery of FRBs using an interferometer, providing scientists with greater accuracy to identify their origin. Manisha Caleb from the Australian National University presented results from the detection of 3 new Fast Radio Bursts (FRBs) using the Molonglo radio telescope in Australia. Fast Radio Bursts (FRBs) are intense millisecond-duration bursts of radio waves believed to originate beyond our own galaxy, and whose source is unknown. Until now, FRBs had been detected exclusively using single dish antennas, and only after the event by sifting through data. Due to the limited resolution of individual dishes, their localisation in the sky is not accurate, making it difficult to figure out their origin. Moreover, only about a dozen FRBs have so far been found this way, making their study difficult. They were initially thought to come from microwaves, but earlier this year, multiple results debated the potential extra-galactic origin of these phenomena. With 3 new FRBs detected in just a few months, the team expects the telescope to be able to detect up to one FRB per week when at full capacity, and to be able to determine with much greater precision their point of origin in the sky. “This is the next chapter in the story, now we’ll be able to observe them almost in real time and so dramatically increase our study sample” says Manisha. Looking forward to SKA, the team expects the very high resolution and sensitivity offered by the SKA’s dishes will allow scientists to determine with certainty the source of these mysterious events. The results will be available on arxiv shortly as well as submitted to the Monthly Notices of the Royal Astronomical Society. Observations conducted with the SKA and other oncoming cosmological surveys are expected to provide scientists with valuable insights into the behaviour of gravity on very large scales in the early stages of the Universe, allowing them to refine our current models and better understand the inflation that drove those early stages. The work, Multi-Wavelength Synergies with Radio Surveys, was presented by Stefano Camera, Research Associate in Theoretical & Observational Cosmology at the Jodrell Bank Centre for Astrophysics of The University of Manchester. The work is based on a statistical analysis of the distribution of galaxies, to eventually be obtained with large-scale surveys conducted using the SKA dishes (SKA-mid) in South Africa. “We need a census of hundreds of millions of galaxies, stretching as far away as possible and covering almost the whole sky for the analysis to be relevant” explained Stefano. The distances of galaxies, however, are hard to measure using solely their radio wave emissions. “Hence the synergy with other facilities”. To get this information, Stefano would use data produced by Euclid and conduct a similar survey with the Large Synoptic Survey Telecope (LSST) in Chile. Euclid is a European Space Agency mission to map the geometry of the Dark Universe and understand the evolution of cosmic structures in the optical/near-infrared, due to launch in 2020. LSST is a wide-field optical survey telescope being built in Chile and due to start operating in 2019.